Misuse of social media tools such as Twitter can have serious consequences, as cases such as McAlpine v Bercow and Monroe v Hopkins show. But those had mere individuals on the receiving end: for our free and fearless press, misusing Twitter is not - so they appear to believe - such a serious matter. 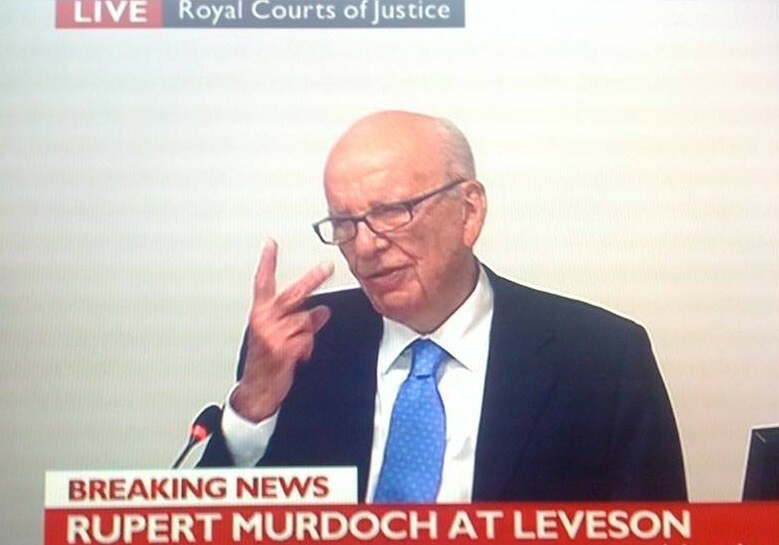 This is what has led the increasingly downmarket Murdoch Times to err from the journalistic straight and narrow. 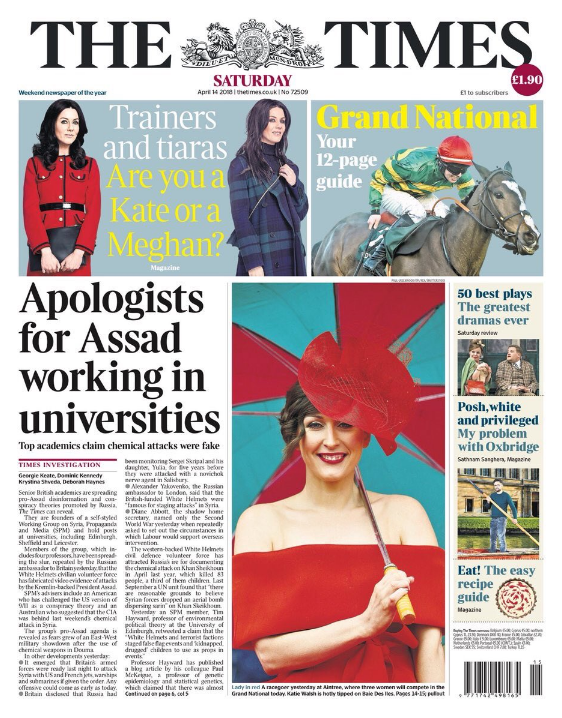 Recent attacks on those working in and around academia have not been restricted to the obedient hackery of the legendarily foul mouthed Paul Dacre at the Daily Mail: last Saturday, the Times joined in with the highly creative main headline “Apologists for Assad working in Universities … Top academics claim chemical attacks were false”. Not quite up to the “Communists in the State Department” standard, but hey ho. 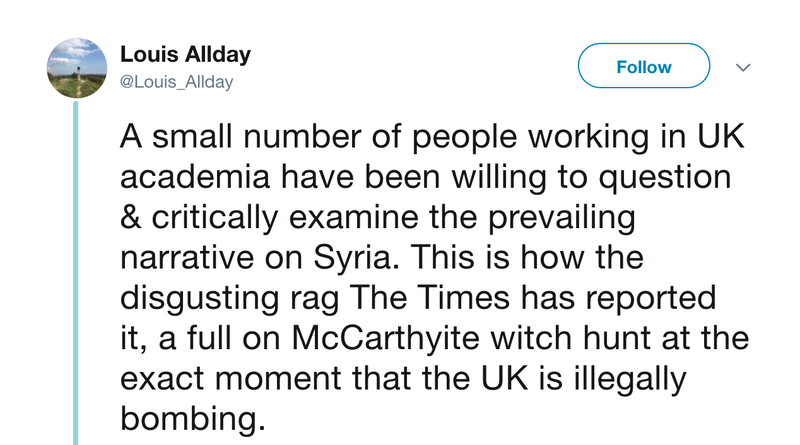 The modus operandi of the former junior Senator from Wisconsin had in the meantime been identified by Louis Allday, who told “A small number of people working in UK academia have been willing to question & critically examine the prevailing narrative on Syria. 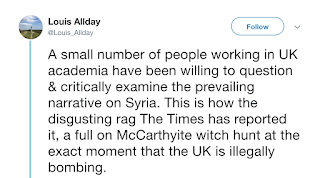 This is how the disgusting rag The Times has reported it, a full on McCarthyite witch hunt at the exact moment that the UK is illegally bombing”. But at first, Allday was a mere spectator: “I am not named but I am part of this group and proud to be so. It is newly formed and has barely even produced anything yet, so they must be worried to be giving it so much publicity at this stage”. 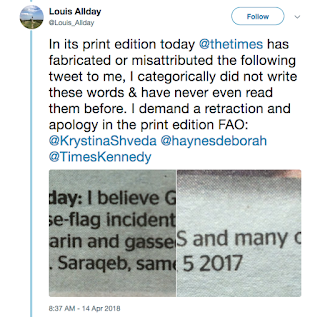 Or maybe not: “I was wrong about not being mentioned, I am extensively in the print edition and The Times has either completely fabricated or misattributed a Tweet to me. Details in next tweet”. 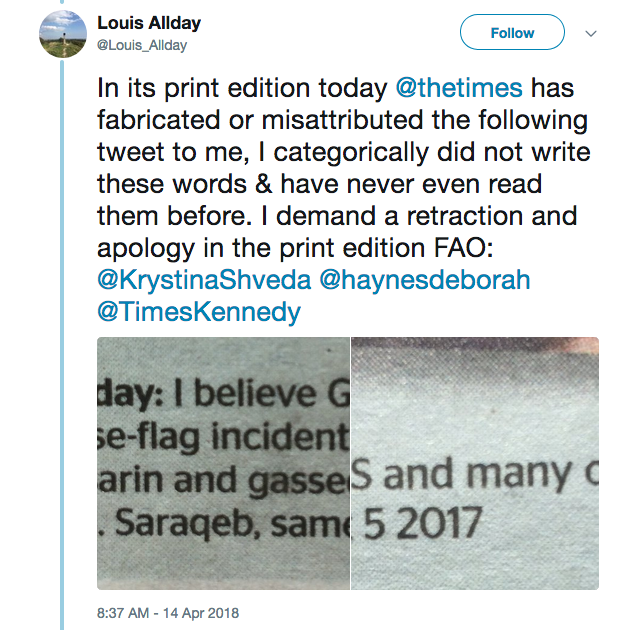 “In its print edition today @thetimes has fabricated or misattributed the following tweet to me, I categorically did not write these words & have never even read them before”. A retraction and apology in the print edition was demanded - hardly an excessive remedy. 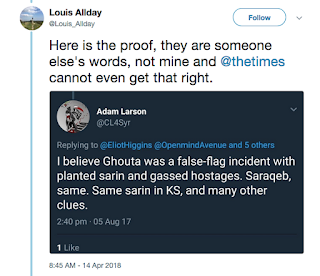 Meanwhile, Allday figured out the actual source of the misattributed Tweet: “Here is the proof, they are someone else's words, not mine and @thetimes cannot even get that right”. That tells you something about the standard of Times journalism nowadays - or, perhaps one should say, the standard of journalism when they’ve had their orders. There was, sad to day, no response, even from those tagged in Allday’s Tweet who were known to be active on Twitter. So came “I am yet to receive any response to this on twitter & will be formally lodging a complaint with the editor of @thetimes demanding that an apology and correction are issued”. And again the press isn’t big enough to say sorry. The print edition - the one that carries the most weight with readers, makes the greatest impression - has been put out there, and any “clarification” will not come until several weeks hence, even then being hidden away in the small print. And, it has to be assumed, the online edition will remain uncorrected, reinforcing the message that the Murdoch press wants readers to hear, and therefore believe. After all, it’s the “Times of London”. Louis Allday has been deliberately defamed. 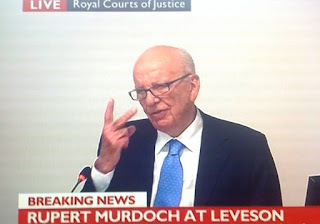 The Murdoch press has clearly calculated that this is someone who doesn’t have the means to take them to the cleaners. Therefore they will please themselves. Their attitude never changes. And that’s not good enough. 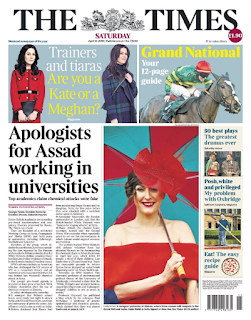 Any day now some utter tory knobhead - probably Bozo - is going to stand up in The House of Comedy and say, "I have a list of card carrying Assad apologists in academia." Happy to chip in a few quid for a crowd funded case.